Salaam Reads / Simon & Schuster Books for Young Readers, 9781534418882, 48pp. Little Leaders meets Good Night Stories for Rebel Girls in this gorgeous nonfiction picture book that introduces readers to nineteen powerhouse Muslim women who rose up and made their voices heard. Long ago, Muslim women rode into battle to defend their dreams. They opened doors to the world’s oldest library. They ruled, started movements, and spread knowledge. Today, Muslim women continue to make history. Once upon a time, they were children with dreams, just like you. Discover the true stories of nineteen unstoppable Muslim women of the twenty-first century who have risen above challenges, doubts, and sometimes outright hostility to blaze trails in a wide range of fields. Whether it was the culinary arts, fashion, sports, government, science, entertainment, education, or activism, these women never took “no” for an answer or allowed themselves to be silenced. Instead, they worked to rise above and not only achieve their dreams, but become influential leaders. Through short, information-rich biographies and vibrant illustrations, Muslim Girls Rise introduces young readers to the diverse and important contributions Muslim women have made, and role models they may never have heard of before, but whose stories they will never forget. A debut #OwnVoices writer, Saira Mir is a Muslim physician from Washington, DC, who has searched far and wide for books to help her daughter find feminist role models who share her heritage. 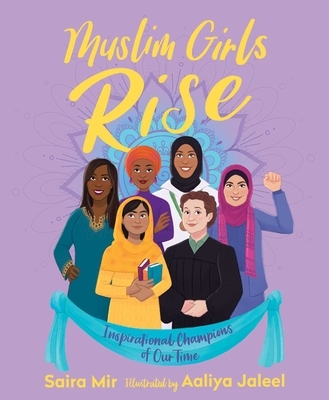 Saira wrote Muslim Girls Rise for her, and hopes to share it with other children eager to learn more about these extraordinary, path-breaking women. Aaliya Jaleel is a freelance illustrator, character designer, and visual development artist. She is currently majoring in animation at the University of Texas at Dallas with plans to work as a visual development artist after graduation.